Theme Party Inspiration: Radiant Orchid Wedding — Everybody's Invited! Only the coolest bride can pull off purple hair on her special day. It’s a new year, which means Pantone has announced a new color of the year: Radiant Orchid. Pantone describes this pretty purple-y pigment as radiating “great joy, love and health.” Due to its visible and symbolic beauty, we’re forecasting that Radiant Orchid will be a popular color palette pick for 2014 weddings. In the Radiant Orchid wedding we’re imagining, the color Radiant Orchid (plus other complementary shades of purple and pink) would obviously provide the color palette. Add in orchids and ombre, and you’ve got yourself an elegant and eye-catching event. The bride, groom, and wedding party would walk down the aisle in perfect purple style. Purple ombre wedding dress by Versace. Whimsical purple ombre gowns for bridesmaids and flower girls. Purple orchid boutonnieres and bouquets for the wedding party and extra special guests. We love the addition of succulents to this orchid bouquet. The purple pumps would add a fun pop of color for a bride in white or ivory. 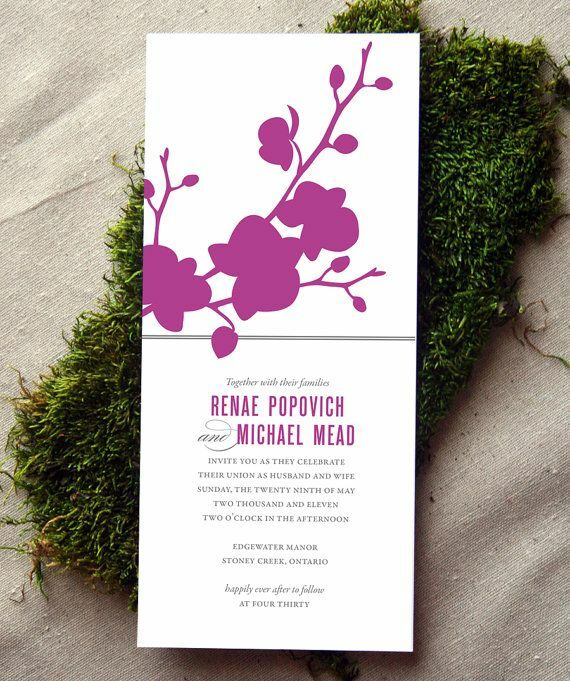 An orchid motif on the invitation would introduce the wedding theme to guests. Everything about this fairytale Portland wedding is pretty perfect, especially the orchid centerpieces. We’re actually not big fans of tall centerpieces (it’s really hard to have a conversation with the people across the table when there’s something blocking your view! ), but we are big fans of bold, colorful tablecloths and twinkly lights. Speaking of twinkly lights, these purple orchid string lights would look great wrapped around an archway or hanging from the ceiling at a reception. An aisle lined with purple orchids? Yes! 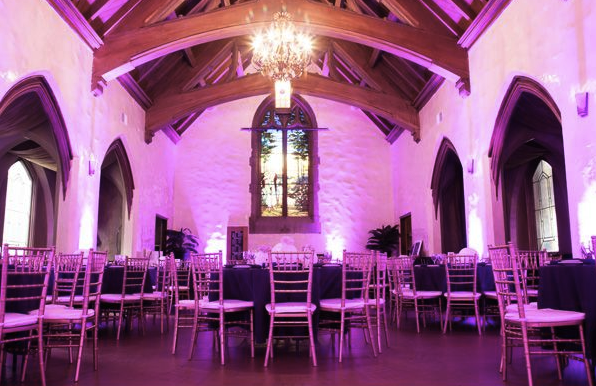 Purple lighting at the reception might be taking the theme a little too far, but it looks so fun! We would definitely sip on these delicious-looking drinks. Remember the stunning ombre wedding dress above? It looks a lot like this creative cake! You really can’t go wrong with purple ice cream, especially when it looks this good. Guests will remember how much fun they had at the wedding when they light this orchid candle favor later at home. You could also add an extra touch of orchid by lighting orchid-scented candles throughout the ceremony and reception. For more Radiant Orchid Wedding inspiration, see our Pinterest board (where you’ll also find all of the above images and their links). What about you? What color palette or theme would you choose if you were planning a wedding right now?